If you don’t mind going out, and you’ve already seen Michael Moore’s “Capitalism,” then you might check out the new sci-fi thriller “Surrogates.” It’s a sci-fi world where people replace themselves with perfect, perfectly beautiful, perfectly athletic, robots that “experience” the world and radio back all the feelings they gather. The actual people, or “operators,” just lie in bed with sensors all over them and have fun without taking any chances. People are free from contagious diseases and random accidents. Plus, they’re perfect, as far as anybody knows. If somebody destroys 8-10 of these perfect machines, which looks in the movie like an awful mass murder, they might get charged with vandalism. In a perfect world like this, humans don’t normally die by disease, accident or by homicide. But, of course, for this mystery movie, homicide has to happen. 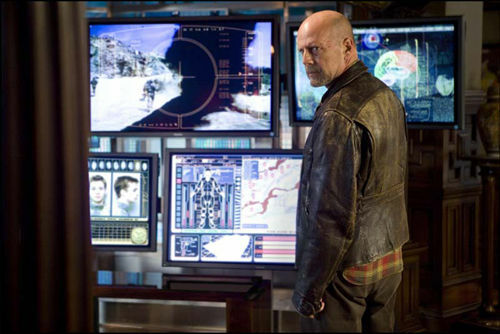 Detective Bruce Willis’ perfect robot doll has to investigate and radio back his findings to old grizzled Bruce, who is lying in bed at home. It’s complicated, but you might guess that the investigation leads toward questioning the whole surrogate world. It gets very rough, and the Bruce-Doll is an early casualty, leaving the detective with only his vulnerable self to investigate a world of perfect robots. He also has to look into the Hippie Reservation, where they get fat and scorn robots. Don’t think that action star Bruce Willis is too “over the hill” for this thriller. His grizzled look is a wonderful contrast to all the perfect robots populating the city. He’s almost the only human out there wandering around. The perfect robots sneeringly refer to him as “meatbag.” Imagine how it changes him! Radha Mitchell gets a really good female warrior role as Bruce-Doll’s robotic police partner. She gets to be other things, too. Most of our sci-fi plots are just extensions of something that’s going on anyway. Usually something bad. Projecting this bad trend forward gives us a disastrous world, of course. Sci-Fi is a great way to investigate trends in our own world, like the trend to give up personal interaction and let our avatars do the walking, talking, and feeling in the virtual world. I think the critics gave “Surrogates” a low rating because they actively dislike movies with a strong message. The message is what makes this particular movie so worthwhile. Of course, it’s well made and a lot of fun, too. So, why shouldn’t we brave our diseased and perilous world to venture out to see “Surrogates” in a neighborhood theater? Or, we could wait for the DVD in the mail. No point taking any chances!